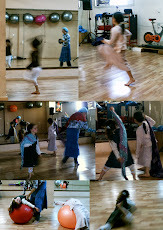 Dance Integration - It's about the BODY, MIND and SOUL - bringing everything together in order to feel whole! To improvise is to dance without pressure (and yet with the option) of imitating someone elses movement style.To dance intuitively and express one self, yet at the same time connecting to others. You do not need any dance background - just a willingness to take chances and respond authentically! Body - Through the movement of the body, one can explore one's inner self. By allowing the students to explore through improvisation exercises rather than mainly through the method of "imitation," the students discover a deeper level of awareness, and can each progress at one's own level. Movement awareness exercises,chakra healing, free dance, dance improvisation to a variety of music, , and dance drama all allow healthy body self-expression in a safe, nurturing and wholesome environment. Mind - Understanding the vocabulary of movement, dance elements, basic choreographic skills, and the methodology of dance improvisation.Developing ones creative side and strengthening the right side of the brain . While living in Israel and in the city of Tsfat for the last 20yrs I developed a way of combining jewish concepts and dance ,which deepens our understanding through experiencial learning.For example the kabbalistic idea of gevurah,hesed and tiferet can be danced in many ways through dance improvisation.Also the idea of "oneness" which is in our shema pray everyday can be deepened and understood through the wonderful median of dance . As well the certain aspects of each weekly parsha can be explored and expressed through dance and dance drama.